Mostly grown for the colourful large flowers, Filipendula are a moisture loving plant well worth a place in the garden. Excellent near a pond or in any other moist soil, in fact they are so brilliant when in flower it is worth creating a most garden area just to grow them. The large sprays of white and pink to red flowers depending on the species are the main attraction. Our favourite is Filipendula palmata (pictured right), tall growing to around 1m, large fluffy ping flowers in spring and it does have very attractive foliage as well, we think the best of all. It does stand out when grown against the deep green foliage of plants such as Camellias. A rhizomatous perennial these plants will spread to form a good clump. However only in moist soils. Plants can be grown from seed however they are slow to germinate, so be a little patient. Filipendula ulmariais often referred to as ‘Meadowsweet’. Filipendula rubra is Queen-of-the-prairie with pink flowers. Filipendula umaria ‘Aurea’ has golden foliage and white flowers. With attractive foliage and colorful flowers most species are excellent plants for a moist part shaded position in the garden. They are fost tolerant, summer flowering and add a little height to the garden border or woodland planting. Filipendula is a perennial growing to about 1m. Full sun or part shade in a well mulched, moist but well drained soil. 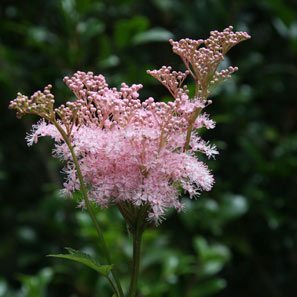 Attractive foliage and with flowers coming as feathery plumes Filipendula are excellent as cut flowers and floral displays. It can be beneficial to prepare the soil well before planting, dig in lots of well rotted compost and some coir peat, this will help with moisture retention. Most species can be cut back after flowering in summer to encourage a second flush of flowers. In Australia Filipendula are best grown in part shade, or at least with protection from hot afternoon sun. They do well on the south side of buildings or where given protection by other plants.